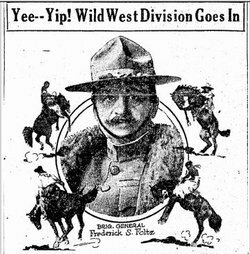 The men of the 91st "Wild West" Division were from California, Idaho, Montana, Nevada, Oregon, Utah, Washington and Wyoming. The 91st “Wild West” Division was one of nine American divisions that assaulted German positions in the Meuse-Argonne on September 26, 1918. As befitted its name, the 91st was originally assembled from draftees inducted from the Rocky Mountain west. Their first days in action were indeed wild, as they attacked toward the enemy-held village of Gesnes against well-entrenched machine guns. Green though they were, the westerners fought with honor, but paid an ugly price. Among their number was the father of a future Hollywood movie star. On September 27, “at dawn, which broke dull and cloudy, the word came to advance. My platoon was told off to support ‘M’ Company of the 363rd Infantry,” Lieutenant Thompson remembered, “so over the hill we started. We had gone about 200 yards when ‘tst-tst-tst-tst!’ and we did an Annette Kellermann [a famous Austrian actress and diving champion] for Mother Earth. I heard a moan from behind and saw a man trying to get up—then he bent over as though to vomit and the blood gushed out in a stream from his mouth.” For two days the attack bogged down. “Bradbury turned to me and quietly said, ‘Well, Farley, lets go.’ I gave the signal to the Company Commanders and, despite the withering hail of steel and lead, as one man the leading Companies rose up and started forward. We moved off directly behind the first wave. Perhaps the charge of the Light Brigade was more spectacular, more melodramatic and picturesque, but not more gallant. Man after man fell but the others continued on through a ‘hell’ of shrapnel and machine gun fire as would be impossible to exceed. “Unfaltering the line of combat groups rolled steadily on over the open, a trailing wake of olive-drab marking its progress. One must not think of this as happening in an instant—over an hour of this bloody plodding along under a tornado of missiles passed before the worst was over. Finally the last crest was topped, and in irregular groups these Gallant boys swept down the last slope into Gesnes. At the first corner stood a German tank. This was taken and the crew shot as they tried to escape, and its gun turned on a machine gun nest. Years later, in a commentary left for his son, Granger gave tribute to those who died: “Nor are the brave men who now lay forgotten in our Government Hospitals, broken in mind and body as a result of the war, any less heroes, than those who died in battle. Perhaps the sacrifice of the living is even greater. Still they live on; forgotten. Learn more about the AEF in World War I and the famed Lost Battalion, in my upcoming book Never in Finer Company: The Men of the Great War’s Lost Battalion! Please share your email address below. You’ll get monthly emails about research discoveries, book updates, and more.